File Name: Kirk Bacus of Nashville, Tennessee. Notes: Kirk Bacus was an Account Manager at Hasbro. Nashville, in the center of the state, is Tennessee's capital and second largest city. To my knowledge, Med Alert was never animated. Accessories: black semi-automatic pistol with round trigger guard (new), black over/under rifle/shotgun with L-shaped stock (new), black helmet with attached mic, side-mounted camera, and yellow light (new), black belt (03 Cross Hair's), dark grey wrist minicomputer (04 Hard Drive's). MED ALERT worked in the emergency room of an inner city hospital before enlisting in the military, so he is highly skilled at remaining cool and competent in the middle of crisis and chaos. He doesn't hesitate to charge into battle to reach his patients, dodging firefights and explosions to reach those in need. He was introduced to Tai Chi Chuan by a patient who used the practice to help himself heal. Intrigued, MED ALERT began studying Tai Chi, quickly mastering the complex movements and discovering its effectiveness in hand-to-hand confrontations. When he first began teaching it to the G.I. JOE Team, most of them wondered how it could help them in battle. 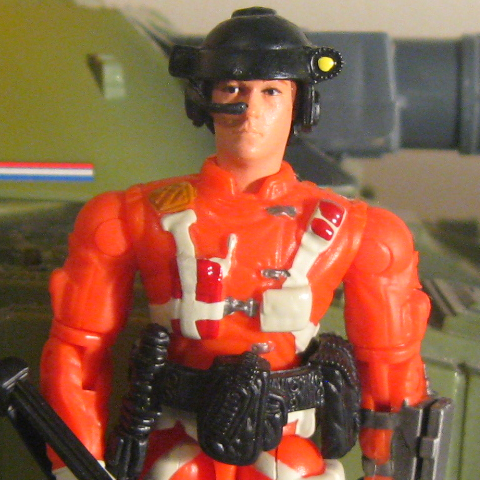 Then they saw MED ALERT go one-on-one with a COBRA VIPER and use his skill to defeat the enemy. Now it's standing room only on class day. "Success does not always go to the swift, nor does victory always belong to the strong." Toy Notes: Item #13020. The same pistol included with many later figures varied in the prominence of the hammer.